I applied OPI's Sparrow me the Drama from last years Pirates of the Caribbean collection. I didn't want to use it on short nails, so I was waiting my nails to grow, but my nails are still short and I just had to try it out. Sparrow me the Drama is such a lovely dusty bubblegum pink. I put OPI - Mod about you on my ring finger as an accent nails. It's gorgeous blue toned pastel pink with a bit weird guppy formula, but 2 coats were enough. If it looks better in person, it must be amazing. I like to try and freehand. I am not great at stamping. Sometimes I can't get the image to transfer in it's entirety. i love mod about you! Pretty, pretty, pretty... as always! so pretty! great tutorial I'll have to try it some time! I think the pictures look great so it must be fantastic in person! I am such a sucker for animal prints, I love them. You should try them freehand they are so easy! The messier you make it the better it seems most times. 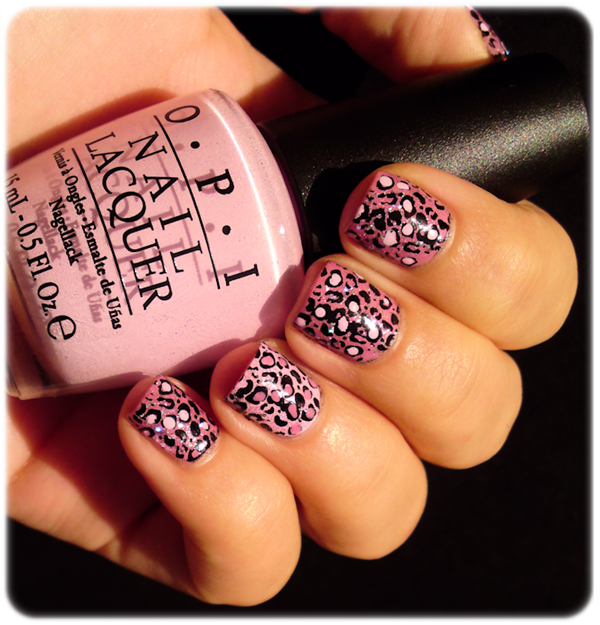 You can't go wrong with animal print... And you always come up with the greatest combos! Manicure inspired by Real Madrid C. F.